Dal, Baati-Churma is a rich-delicious Rajasthani dish. 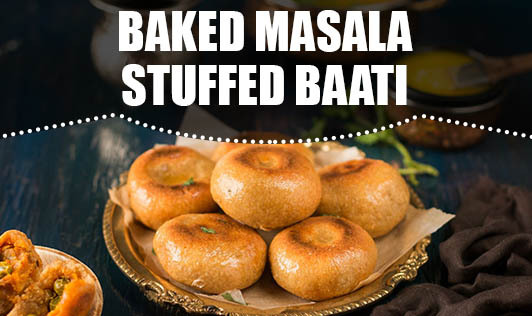 Made with whole wheat flour and stuffed with green peas stuffing, baked masala baati is a delicious healthy version of the traditional dish. The twist here is that the baati is baked, thereby making it low in calories and also making it easy to prepare as the whole lot is baked in one go. Serve the battis fresh off the oven along with panchmel dal and churma. Mix all the ingredients together in a bowl and knead along with milk to make firm dough. Knead for about 3 to 4 minutes. Divide the dough into 10 equal parts, cover with a wet muslin cloth, and set aside for 20 minutes. Heat oil in a nonstick pan, add cumin seeds and hing. When the cumin seeds crackle, add the ginger-green chili paste, chili powder, coriander powder, and mix for a minute. Add the green peas and salt. Mix well and cook on medium flame for 2 to 3 minutes, while stirring continuously. Remove from the flame and allow the stuffing to cool. Divide into 10 equal parts and keep aside. Roll out the dough into a small thick roti. Place a portion of stuffing in the center of the dough and slowly wrap the filling with the dough by slightly stretching and pressing over the filling. Seal the ends tightly and remove the excess dough if required. Flatten the kachori baati slightly. Bake the baatis on a greased tray at 250°C for 25 minutes. Serve hot with dal, churma, and ghee.